Good morning!! How are you all today?! 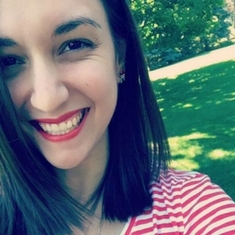 First Tuesday where I'm not posting alongside the Twinsies. For those who missed the Update post, the Twinsie's are taking the month of December off to recoup and enjoy the holiday season! We will be back posting the week of Christmas, then back again in January starting fresh! So without a prompt, that means I was free to create whatever my little heart desired today! 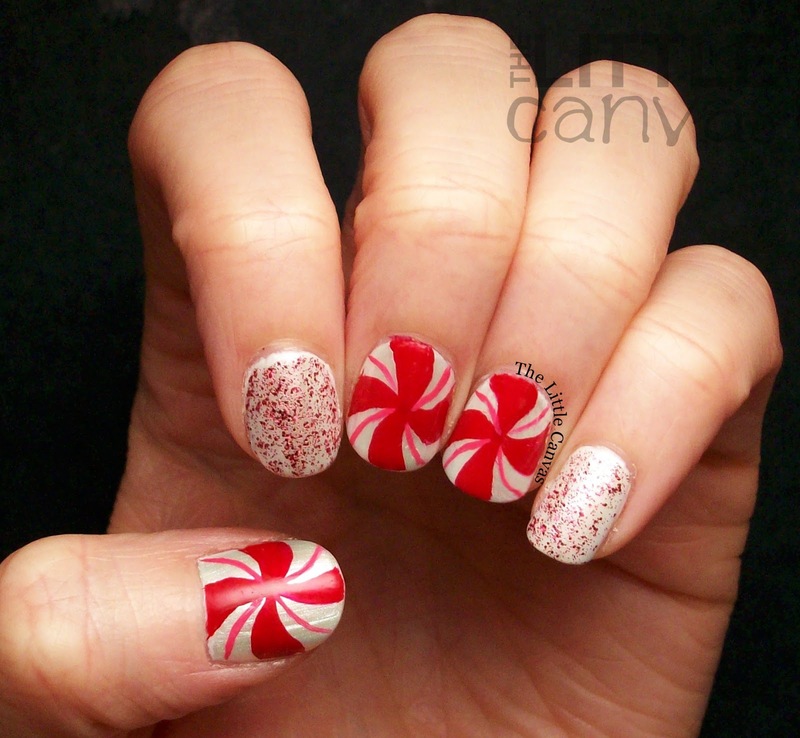 Since it's December, well you know that means it's time for me to start some Christmas nail art! I was going to wait a little longer, but with all the new designs I've been finding, and the new glitters screaming to be used, I had to start! 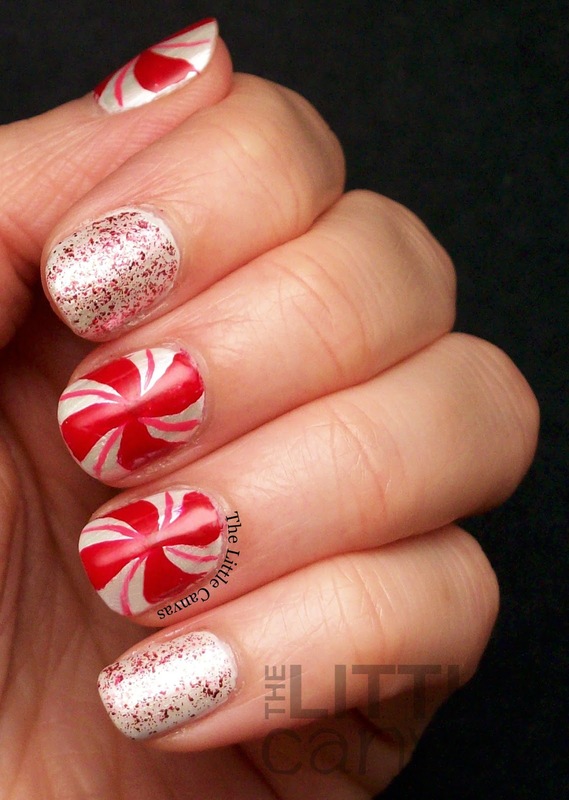 Today's design is a recreation of my peppermint nails I did ages ago! I've seen many different interpretations over the years and wanted to try them last year but never got around to it. Okay, that's a lie. I did them last year, they looked awful, and I never posted them. This year though, with the help of some new stripers, I was able to do it! I love the base of my manicure! I decided to add a top coat of Moonstone over a plain white because it gave the nails a pearl like finish which is similar to the peppermint candies! 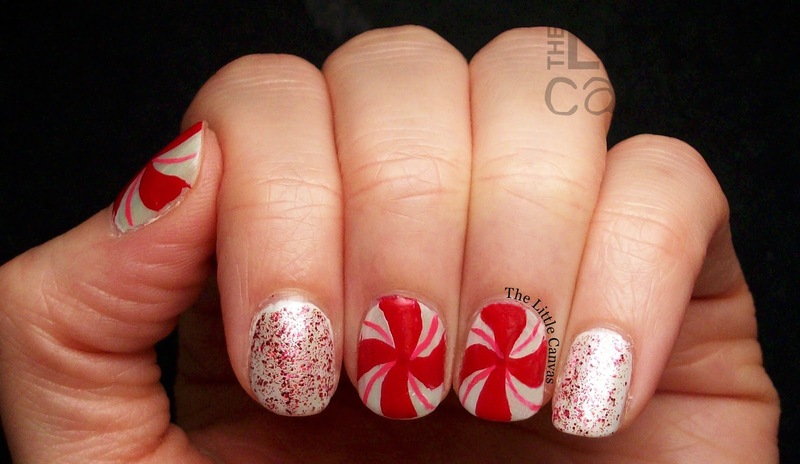 When my base was dried, with the Red I <3 Nail Art Brush, I started outlining the peppermints. Took awhile to do on the first few nails because I had to get used to the length of the striper brush. Compared to other stripers I've owned, these are shorter, meaning there is more control. Only downside for me was that polish started to move down the little stick and gather on the brush when I didn't want it to. The red glitter is FingerPaints Sugar and Spice from the Winter Wishes collection. Such a gorgeous red glitter! In the bottle, you can't really tell that it has all these different size shreds of glitter. I thought it was a simple microglitter. I did one thin coat over my pointer and pinkie. You could get away with two coats on a naked nail and have full sparkly red coverage! Really loving this pretty red for the holidays! I might even be able to use it at Valentine's Day and the Fourth of July :). I love Christmas glitters that can be used year round! What do you think? 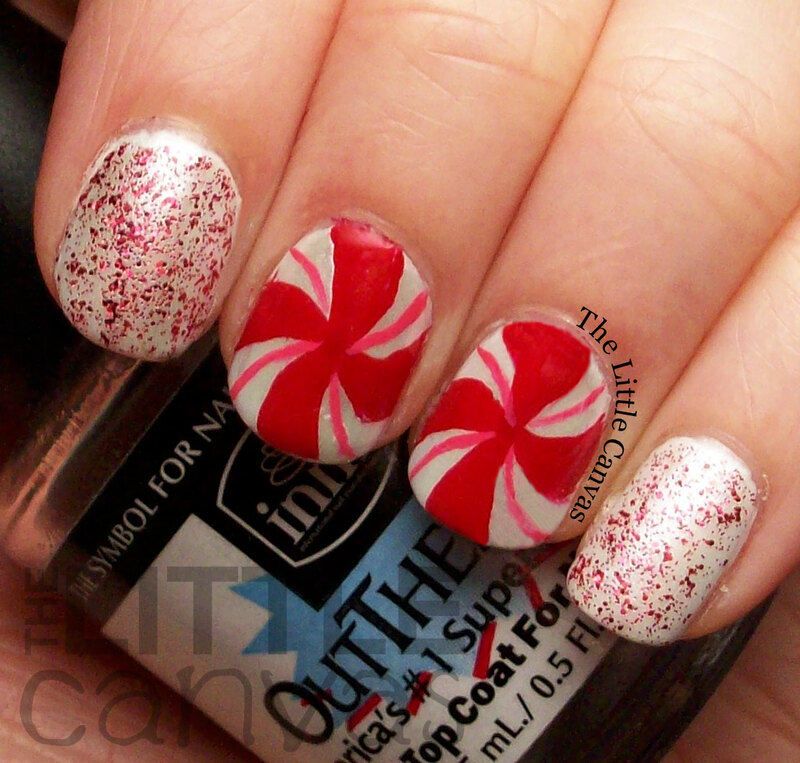 Liking this peppermint manicure? FingerPaints Sugar and Spice is available now at Sally Beauty Supply! The Sally Hansen I <3 Nail Art Stripers can be found at your local drug stores! The Beauty Buffs: New Years! FingerPaints Bright Lights Big City Giveaway! Bestie Twin Nails with Fashion Footing: Round 7!